I love to sing. That’s the reason why the first thing I bought with my first paycheck was a Sony karaoke. It was a dream come true to finally be able to sing with a microphone! And people tell me I’ve got the voice. Humility aside, I was commissioned twice to record political campaign jingles. Singing used to be my pastime until motherhood beckoned and work became hectic. Without noticing it, I have soon forgotten about the one thing that makes me happy. Now it’s my son who’s hogging the limelight and the microphone! 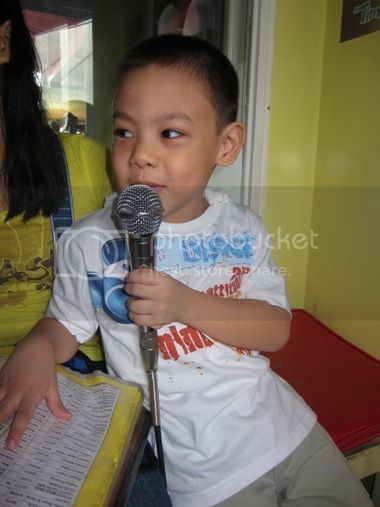 Whenever he sees a microphone, in Timezone or at his grandparents’ house in Cavite, he will sing the same songs over and over again until his voice gets hoarse. So yes, I have been dethroned by my very own son! LOL! But I’m not bothered; I’m actually happy that my son is showing interest in music. I’m even planning to buy him digital reference microphones to hone his singing skills. I said “microphones” because I intend to buy two, one for him and one for me. This is to ensure that I also get to sing with a microphone at home. LOL! This entry was posted in Microphone, Songbird. Bookmark the permalink. One Response to My Little Songbird! ← I’m Done with my Homework, Mom!